One of the most enduring popular herbal remedies on the market, Borneo Kratom – derives much of its power from the land it is grown upon. Borneo is not the remote and tiny paradise some Westerners may assume it to be from TV and movies. In fact, Borneo is the 3rd biggest island on earth. It’s number one in Asia alone, with nearly 20 million residents and 300,000 square miles of gorgeous island terrain. It was here that the Mitragyna Speciosa Kratom tree naturally began to grow thousands or even millions of years ago. Since then, fans of this powerful plant-based remedy have embraced its health-enhancing and mood-lifting effects. Before you seek out your own taste of island life, let’s clear up what people mean when they refer to Borneo kratom. Is Borneo Kratom The Same As Bali? 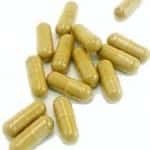 The most important factor of any alternative healing regimen is learning about the supplements you are taking. Sometimes remedy names themselves can be both enlightening and confusing guideposts on the journey to health. Borneo Kratom is also sometimes referred to as “Bali.” That’s because when kratom first started to be exported from Indonesia to the west, some Borneo-grown products were taken to Bali ports for shipping. Over time, both names were used to refer to the same product. So, if you’ve read about Borneo products and can only find Bali available online for purchase, or vice versa, it’s a good bet that both refer to product grown in Borneo. The good news is, both Borneo and Bali-named products are considered sophisticated, high-quality varieties with a wide range of desirable effects for mind and body. Simply select the plant color known to produce the affects you are looking for and you can’t go wrong. 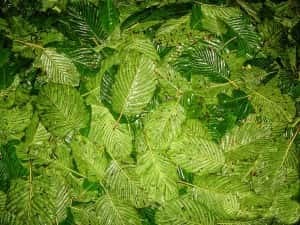 The color of the central vein in the leaves of a kratom tree holds the key to the types of effects you’ll experience when you consume it. As online reports sometimes criss-cross the colors with general effects, let’s simply break down what you can expect from each type of Borneo leaf. Red Borneo – Take this strain when you are seeking maximum relaxation. Red strains like Red Bali are known to have a more sedating, soothing effect. They are also the best pick for pain management. The smooth analgesic qualities of red leaves from Borneo are well-known. 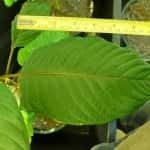 White Borneo – The less common White Vein Borneo form of kratom leaf is best taken to alleviate feelings of depression, lethargy, and lack of focus. You can expect all-day energy from this strain, without the jitters of coffee. Green Borneo – The excellent all-around Green Borneo Kratom variety encompasses the best of both other color strains. Most users take it to enhance overall mood, often elevating to euphoric levels. Green Borneo is also widely known to remove aches and pains from chronic conditions. It allows for work-ready focus, while taking away stress and anxiety. For these reasons, it is a very popular strain year-in, year-out. Can’t choose among strains? This is a common phenomenon. Sometimes when we read lists of indications for an herbal medicinal, some or all symptoms/desired effects may apply to us across multiple varieties. One great way to get the best of all worlds is to try a blend. 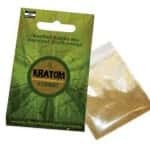 Whenever you see the word “blend” on a kratom product, it indicates that the leaves of several different type of plants have been combined to create one product. So, in the case of a Borneo Blend, the medicinal powder will be comprised of red, white, and green leaves. What prevents the effects of a blend from counter-acting one another? As with all elements of the natural world, when using all-natural plant based products, the overall effect tends towards harmony. The individual effects of each strain complement and in fact boost one another, instead of cancelling each other out. 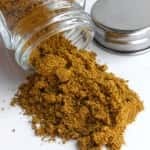 Whether it is called Bali or Borneo Kratom, all of these beneficial plant products from the biggest island in Asia are beloved for the same reason: natural feeling relaxation, smooth and lasting energy, and a host of mood-improving benefits including stress relief and the easing of depression-related symptoms. That makes this one tropical island vacation you won’t want to miss. 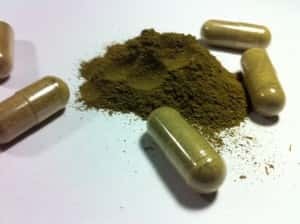 Borneo Kratom powders and capsules might not be as strong as other strains like Maeng Da, but they are still an excellent choice for new users.